Play with double-meaning illusions like "Face or Vase?" or build a bank that makes your money disappear. Yes, your mind plays tricks on you. But we prefer to call them magic tricks. 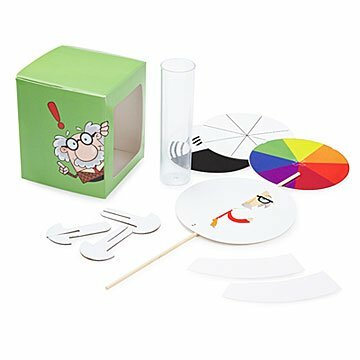 This science kit makes games out of what we see, and what we don't: Double-meaning illusions like "Face or Vase?," a DIY piggy bank that makes your money disappear, and special color spinners with hypnotizing powers. (We kid… or do we?) With more than a dozen activities, it's a great gift for imaginative young scientists, and adults who want to have their mind blown, too. Ages 6+. Made in China. Optical Illusions Kit great product, great value.